Transplantations of tissue-engineered windpipes with synthetic scaffolds in combination with the patient’s own stem cells as a standard procedure, means that patients will not have to wait for a suitable donor organ. For the first time in history, a patient has been given a new trachea made from a synthetic scaffold seeded with his own stem cells. The patient, a 36-year old man, is well on the way to full recovery and was discharged from the hospital July 8, 2011. 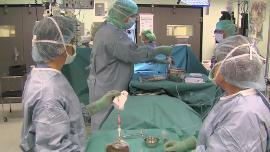 The operation was performed on June 9, 2011, at Karolinska University Hospital in Huddinge, Stockholm, by Professor Paolo Macchiarini, of Karolinska University Hospital and Karolinska Institutet, and colleagues. Professor Macchiarini led an international team including professor Alexander Seifalian from UCL (University College London, UK) who designed and built the nanocomposite tracheal scaffold and Harvard Bioscience (Boston, USA) who produced a specifically designed bioreactor used to seed the scaffold with the patient´s own stem cells. The cells were grown on the scaffold inside the bioreactor for 2 days before transplantation to the patient. Because the cells used to regenerate the trachea were the patient’s own, there has been no rejection of the transplant and the patient is not taking immunosuppressive drugs. The patient had been suffering from late-stage tracheal cancer. Despite maximum treatment with radiation therapy, the tumor had reached approximately 6 cm in length and was extending to the main bronchus. It was progressing and almost completely blocked the trachea. Since no suitable donor windpipe was available, the transplantation of the synthetic tissue-engineered trachea was performed as the last possible option for the patient, referred by Professor Tomas Gudbjartsson of Landspitali University Hospital (Iceland) who was also part of the surgical team. The successful transplantation of tissue-engineered synthetic organs, referred to as regenerative medicine, could open new and very promising therapeutic possibilities for the thousands of patients who suffer from tracheal cancer or other conditions that destroy, block, or constrict the airway. Professor Macchiarini has previously performed successful transplants of tissue-engineered tracheas, but on those occasions the tracheas used were taken from organ donors and then reseeded with the patient’s own stem cells. Transplantations of tissue-engineered windpipes with synthetic scaffolds in combination with the patient’s own stem cells as a standard procedure, means that patients will not have to wait for a suitable donor organ. This would be a substantial benefit for patients since they could benefit from earlier surgery and have a greater chance of cure. In addition to treating adult patients; tissue-engineered synthetic trachea transplants would, not least, be of great value for children, since the availability of donor tracheas is much lower than for adult patients.